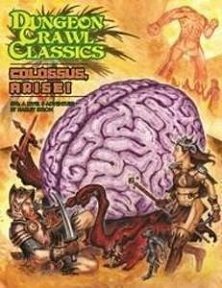 Dungeon Crawl Classics RPG: Colossus, Arise! Ancient desert-cities where long-dormant giants stir and seek to revive even older deities... this sounds like it may prove a challenge and indeed it does. There's a lot of backstory that only someone who studies history and legends is likely to have heard about, but perhaps characters at the lofty heights of level 8 have time to sit around and read. Renowed heroes, they are probably rulers by now - so the adventure hooks are peppered with things like deputations of nobles approaching a character seated on his throne and asking for assistance. Basically, we are currently in the Third Age of Man. The abandoned city and its restless giants date back to the Second Age, and once they surface they regard the Third Age fellows as inferiors, pale shadows of what Men once were... (the Titans say the same about the Second Agers of course, but we'll gloss over that for now). Their ultimate plan is to remove these pesky Third Agers and cleanse the place ready to take their place in the sun once more. Someone had better go and sort them out. Inside they may explore to their hearts' content, wandering monsters permitting, but ultimately find that the only building standing is a temple, and what lies beneath. There are ample opportunities to die (usually horribly) as they venture further in and down, for this temple has been reactivated and is being used to further the Second Agers' schemes. The end - should they survive that long - involves the rising of a Titan, and cinematic levels of destruction and is certainly something that will never be forgotten by anyone who survives to tell the tale. If your party is jaded, this will shake them awake and provide one last epic adventure before they hang up their swords. They'll need to be lucky as well as skillful to survive, though, but if they do they'll have a tale to tell that they can dine out on for the rest of their lives. Return to Colossus, Arise! page.